Inside wall of the Brohammasmobile. I aspire to one day own a home, or a space, that is both comfortable and interesting. A place that is more curated than decorated. On occasion I will peruse import stores with all their exotic statuary or fabrics and I always leave with none of those things. My wife, tired of accompanying me on such ventures inquired why I never procure any of these treasures. One day I may get myself to Persia. While there I will still not get that rug; I don’t like Persian rugs. I do hope that while I am there I will obtain some little something that I could only get there, or possibly get something I should only get there. In travels past I have gotten a beer stien in Germany, an Eifel tower in Paris (a smaller one of course), and a sunburn in Mexico. This year has been no different. I made acquisitions of things that would remind me of a time and place, in hopes that one day said articles will have a spot in that place; the one I hope to one day create. The spoils of war, without all that messy fighting. 1. Ukule from Haleiwa Hawaii. 2. Hat from J. Press in New Haven Connecticut. 3. Logo tie from Lionel Smith Ltd. in Aiken South Carolina. 4. Vintage print from the Baseball Hall of Fame. 5. 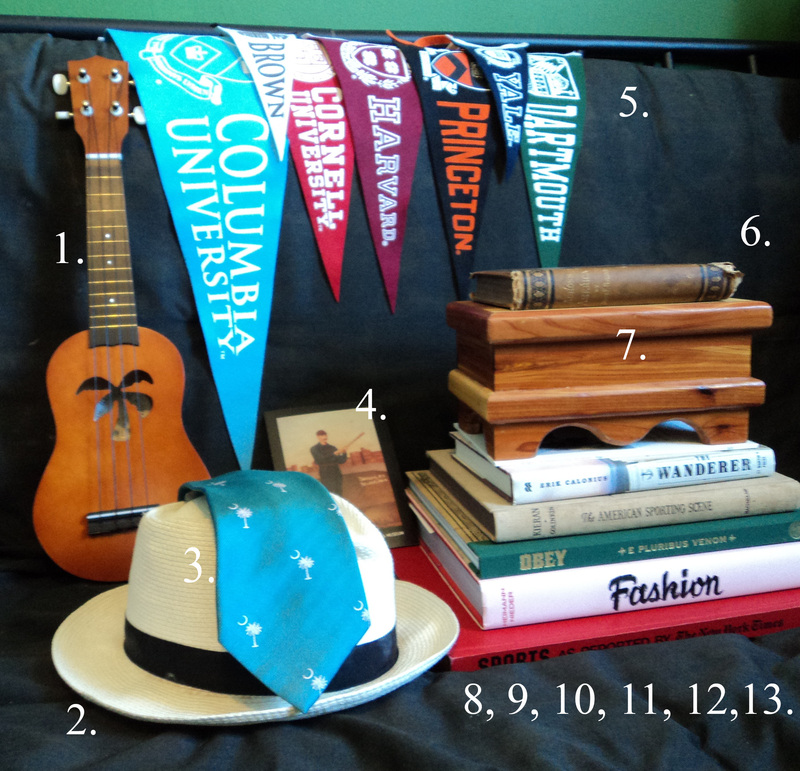 Pennant purchased in the bookstores of every Ivy League school (can you see which one is missing without using digital assistance?). 6. Across America By Gen. James F. Rusling, printed 1875. Its take on my native people was, shall we say, “interesting”? 7. Maple box sold to me by a young Amish boy in Nowheresville, upstate New York, while his father peered eerily through the curtains of the house. 8. “All Right!”: The Narrative of Henry Box Brown as a Test Case for the Racial Prescription of Rhetoric and Semiotics, by Marcus Wood. Purchased at the American Antiquarian Society in Massachusetts. 9. The Wanderer the Last American Slave Ship and the Conspiracy That Set Its Sails, by Erik Calonius, purchased at a thrift store in Wilmington, North Carolina. 10. The American Sporting Scene, written by John Kieran, illustrated by Joseph W. Golinkin, printed 1941. Purchased in Cambridge Mass. 12. Fashion 100 Years of Apparel Ads by Jim Heimann and Alison A. Nieder. Purchased in Newport, Rhode Island. 13. Sports as reported by the New York Times 1908-1984 (reprints of sports stories from the NYT). Purchased in NYC. Of course, not everything experienced whilst travelling can be collected. Some things while collectible, should probably not be collected. 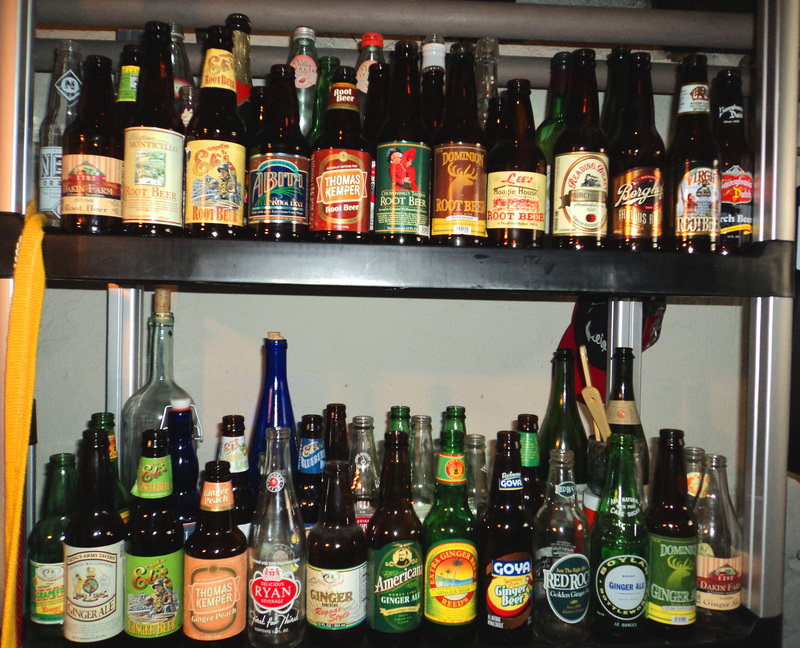 Somehow my collection of craft brewed soda bottles has been sent to the cellar. Kinda makes me wonder who really is the king of my castle. You have a great collection. My thing is collecting stuff from what ever public transportation exists in the city I’m visiting. I have t-shirts from the Paris Metro, LA Metro, a bunch of NYC subways tees and some stuff from the L in Chicago. Collecting is so much fun. And I def agree it’s a must to get the stuff in the place they are related to. “Only if it has a story”, is my method of collecting. I have a lot of nice stuff given to me by others but the only things I value are those which came with a story. Any tattoo tales to go w/ the stuff? When are you coming to W. Mass. to box ‘n feast? I need to order some soda for the holidays, btw. Hope you and your fam are well. Brendan gets the prize for picking Penn. I have it, just didn’t add it to the pic. Matter of fact, I haven’t posted on Penn, possibly because I’m there regularly; more of a “round town” post I suppose. Believe it or not I am un-tatted and fully intend to remain so. I don’t know my travel schedule but believe me, when I hit Western Mass, you are first on my list. Val, subway T’s? Fantastic. I request your blog begin posting pics of your T’s actually on the train they tout. No “chunnel” T? UBJ, Life is best when its full of good stories right? Oh yeah, Brendan, you had a doubley unfair advantage on the pennant thing. What sound would a Horned Frog make? Two weeks in a row? Yes… I was ignoring you UBJ. Lose the Palmetto/Crescent Moon tie. Such items are for SC Natives only. @Chucktown, so no dispensation for transplants? IF not, I can simply put it aside with my daughter’s “Carolina Girl, Best In the World” shirt and license plate placard. She was born ther, can she wear the tie?